Born in Wales, Sassoon grew up in apartheid South Africa, which she perceives to have had “its own uncomfortable visual reality”. Her early paintings capture white, sunburnt women in bikinis grimacing into the glare as well as black waiters in white gloves with their heads lowered while serving white people who looked away. Some of her works from this period can be found in collections at Johannesburg Art Gallery (JAG), Wits Art Museum (WAM), Durban Art Gallery and Chelsea and Westminster Hospital, London. In 1976, Sassoon worked with key cultural figures in South Africa, Barney Simon and David Goldblatt, to co-curate an exhibition of unclaimed photographs from Diagonal Street studios for the opening of the Photographers’ Gallery at the Market Theatre. Other creatives with whom she collaborated were Dumile, Lionel Abrahams, Robert Hodgins, Deborah Bell, William Kentridge, and Paul Stopforth. 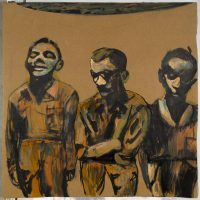 During this heightened period in South African history, Sassoon attended and surreptitiously drew what she saw at Black consciousness leader Steve Biko’s 15-day inquest as well as the Soweto Students trial following the 1976 uprising. Sassoon drew as a way of engaging and digesting the times – at political meetings, funerals, theatres and on all-white buses – with everything leading to painting. Other source material included swimming magazines, photographic love comics and unclaimed studio photographs. Her work remains heavily mediated by photographic and filmic images. Married to the Rand Daily Mail journalist Benjamin Pogrund, Sassoon had daily insights into apartheid and traveled with him on work trips. They went to Mozambique in 1975 – a time of great jubilation and hope – after the Portuguese had fled and the Mozambique Liberation Front (FREMILO) was en route to the capital, Maputo. She was close friends with Robert Sobukwe after his release from Robben Island and visited Nelson Mandela at Pollsmoor Prison with her husband. In 1986, Sassoon moved to London where she continued to reflect concerns around the idea of the “Other”. She worked with themes of proximity and aloneness, depicting people in cluttered domestic interiors and the packed London Underground. Since moving to Jerusalem almost twenty years ago, Sassoon continues to engage what she describes as “the painful complexity of [her] surroundings”. 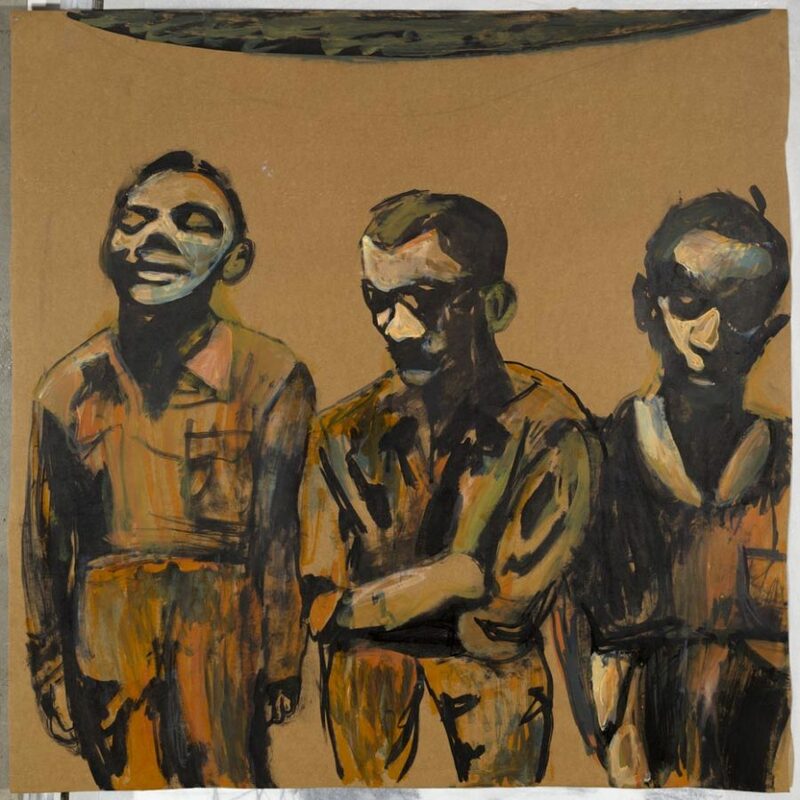 This can be seen in her grappling with conceptual “doubles” in her depiction of biblical half-brothers Isaac and Ishmael whose narratives overlap in the Torah and Koran but cannot be resolved. Sassoon’s work is centered around the figure because, in her own words, “once a human being enters the frame, something interesting and important starts to happen”. 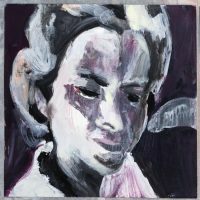 She saw Francis Bacon’s first retrospective at the London Tate Gallery in her teens, which turned out to be a considerable influence on her painting. For Sassoon, “he proved that painting can be as relevant as the daily newspaper, while luscious and fantastic on its own terms”. 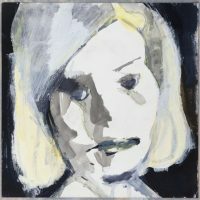 German expressionists, such as Max Beckmann and Emil Nolde, have also influenced her approach.